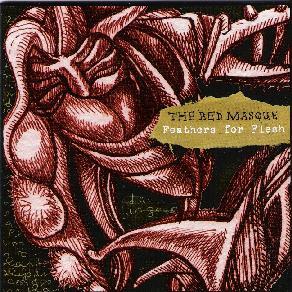 The Red Masque - "Feathers For Flesh"
Feathers for Flesh is a dark, complex, haunting experience. Filled with spooky atmospheres; harsh, angular rhythms and challenging, ever-shifting musical passages from multi-instrumentalists Kiarash Emami, Brandon Ross, and Vonorn, and the remarkable vocal work of lead singer Lynette Shelley, the music of The Red Masque is like King Crimson’s Red period colliding head on with shadowy goth rock. But even that seems to simplify a sound that draws on numerous influences not just from rock genres like space rock and RIO, but also from jazz, medieval music, avant-garde classical, horror movie soundtracks and many others. Feathers for Flesh is the third release from this Pennsylvania quartet, and although I haven’t heard their previous albums, this one certainly displays a mature and accomplished sound that is mesmerizing and refreshing to listen to. The Red Masque seem equally comfortable playing in Dead Can Dance-like acoustic territory, as on the lovely, folksy and dream-like Beggars and Thieves, and exploring eerie and disquieting sound collage, as on the album closer Scarlet Experiment. Brandishing their trademark intricate, ever-altering progressive sound, the sometimes difficult and demanding nature of the music can suddenly be interrupted by moments of stark and reflective beauty too, or even complex and jazzy melodicism, all in the course of a single piece, such as the 14-minute long Passage, my favorite track on the album. Challenging prog rock fans rejoice, Feathers for Flesh is definitely no watered down neo-prog. This is an intense midnight celebration of the mystery and beauty of music in all its forms. Highly recommended. For more information you can visit The Red Masque web site at: http://theredmasque.com. Visit the Big Balloon Music web site at: http://www.bigballoonmusic.com.